… which is actually a pretty good description of my politics. 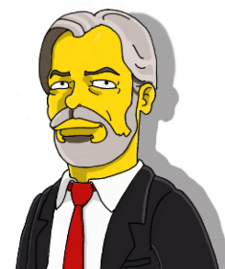 Anyway: In 1888, the Journal des Économistes  the chief periodical of classical liberalism in France, at that time under the editorship of Gustave de Molinari himself  published an article about individualist anarchism in America, with particular focus on the writers associated with Benjamin Tuckers periodical Liberty. The author was Sophie Raffalovich, about whom more below. Benjamin Tucker replied in the pages of Liberty a few months later. The Journal des Économistes would return to the subject of Tucker and Liberty in 1902, in a piece by Paul Ghio. Ive now translated and posted the pieces by Raffalovich (The Boston Anarchists) and Ghio (An American Anarchist); Ive also posted Tuckers reply to Raffalovich (A French View of Boston Anarchists). So who was Sophie Raffalovich? Most of the information Ive been able to find out about her (see especially here, here, and here) is really about her family. Her parents were the Russian Jewish banker Hermann Raffalovich and the anti-Bonapartist literary patron (and Spencer/Mill fan) Marie Raffalovich; her brothers were the economist Arthur and the poet Marc-André. In 1890 she married the Irish reformer William OBrien (he writes about her, with somewhat gag-inducing sentimentality, here), with whom she clashed on the issue of womens suffrage (he was for it, she was against  her gay brother was also against gay rights, so I guess it figures), and published several books of essays as Mrs. 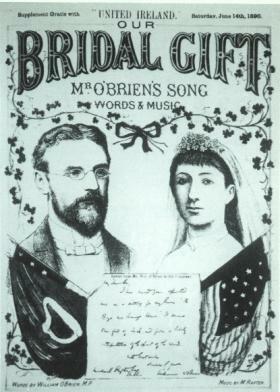 William OBrien. The only picture Ive been able to find for her is from an announcement of their wedding (right); I dont know why her nationality is represented by what looks like an American flag. (His is the Irish naval jack.) After losing her fortune in World War I (it had been invested in Russia and Germany) and her husband in 1928, she moved to France, where she hid out during World War II and the German occupation  not the safest spot in the world for a Jewish libertarian  and managed to evade Nazi scrutiny. She spent her final years as an impoverished invalid in Picardy. When she was born (1860), Jules Verne had not yet published his first book; when she died (1960), Sputnik had already fallen from orbit. Paul Ghio is much more of a cipher; Ive found no birth or death dates for him. He taught economics at the Collège Libre des Sciences Sociales in Paris. He would later write an entire book on American anarchism, as well as volume 1 of an economic treatise (but Ive seen no evidence of a volume 2). The latter work is dedicated to Molinari, and sings the praises of La Boétie to boot. Ghio also has an essay in the Journal des Économistes on the Chicago anarchists, which I may translate when I get a chance.